Rabbits generally aren’t ones to make a fuss, being the quiet creatures that they are. But, as the saying goes, sometimes it’s the quiet ones you have to look out for. 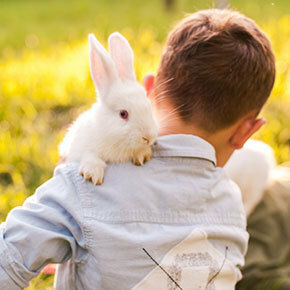 Even the most insignificant-seeming behaviour could have real meaning for your rabbit, so it will pay for you to understand some of the common behaviours. Every rabbit is different, but they share some behaviours which are their unique way of communicating with you. From thumping to nipping, we’re going to explore common rabbit behaviours and what they mean. Probably the behaviour rabbits are best known for, but it’s important to know what it signifies. Rabbits will thump their hind legs when they sense danger to warn others in the area to watch out. Rabbits won’t often nip as an aggressive behaviour. It usually means they want attention and they don’t mean to cause any harm by doing this. But it’s still best to discourage this behaviour by crying out when they do nip. They can nip aggressively if they’re feeling territorial and you’re in their space. Digging is another tell-tale sign that your rabbit wants attention. Nudging can mean a few different things. If your rabbit nudges you, it may be a greeting or it may indicate they are a bit bossy and they’re letting you know that you’re in their way. Nudging may also be a call for attention if you’re not petting them. Bunnies at ease will sometimes roll over completely on their side. This may look worrying at first, but it shows they are content. Teeth grinding can mean a couple of different things. If they are relaxed and lying down then teeth grinding can demonstrate contentment – it’s almost their way of purring. If they are grinding their teeth while hunched and tense then it’s likely they’re in pain.